Weihai Haida Ferry Co., operating in NE China, has placed an order for a 2,200-passenger/1100-lane-metre Ropax ferry featuring a MAN Diesel & Turbo propulsion package. Weihai Haida is the exclusive operator on the route between the major cities of Weihai and Dalian on opposite sides of the Bohai strait in NE China where it undertakes a Ropax service. The company currently has two vessels in its fleet operating on the route – the ‘Xin Shen Shen’ and ‘Shen Shen 1’ – with the former shortly due to exit service. The newbuilding will be constructed at local Huanghai shipyard and will be called ‘Shen Shen 2’. It will feature a twin-screw propulsion plant comprising two well-proven MAN 9L32/40 (IMO Tier-II compliant) four-stroke engines manufactured by MAN Diesel & Turbo in Augsburg (Germany), two Renk single-reduction gearboxes with PTO shaft to drive alternators, and two MAN CP propellers using the new, high efficiency type Alpha VBS1020 Mk 5 design. Additionally, the Alphatronic 2000 has been designated as propulsion control system. MAN Diesel & Turbo Frederikshavn (Denmark) will support the integration of the full propulsion package. The new ferry will be capable of carrying its 2,200 passengers at a design speed of 18 knots. Along with the optimised propulsion package, Weihai Haida has also ordered engine spare-parts from MAN PrimeServ, MAN Diesel & Turbo’s after-sales division. Weihai Haida is a new customer for MAN Diesel & Turbo but the company has a longterm relationship with Huanghai shipyard that has seen the construction of eight Ropax ferries with MAN four-stroke propulsion systems to date. 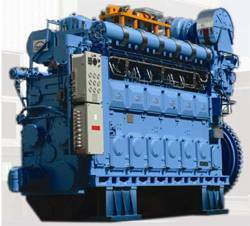 The shipyard has also ordered 34 MAN Diesel & Turbo license-built, two-stroke engines in this time. The regional increase in tourism is an important driver for the order of the ferry. The city of Weihai and its hinterland has a fast-developing and attractive seaside location and is currently experiencing growing numbers of tourists from northern China, especially from around the Dalian area.